To say you can give merely half-an-hour a day to an allotment is tempting but is it possible? No. The Half-Hour Allotment was first published in 2006. I'm treading on icy ground here. Lia Leendertz is a gardening journalist and has an allotment. I'm just me and I don't have an allotment. But by the end of the first chapter I was exhausted and (in my imagination) broke. Before any time at all I'd got the idea that setting up an allotment is expensive and time consuming. Right on the second page to the introduction Lia herself suggests 'half-an-hour' might might be re-interpreted to mean 'two hour-and-a-quarter visits over two days'. 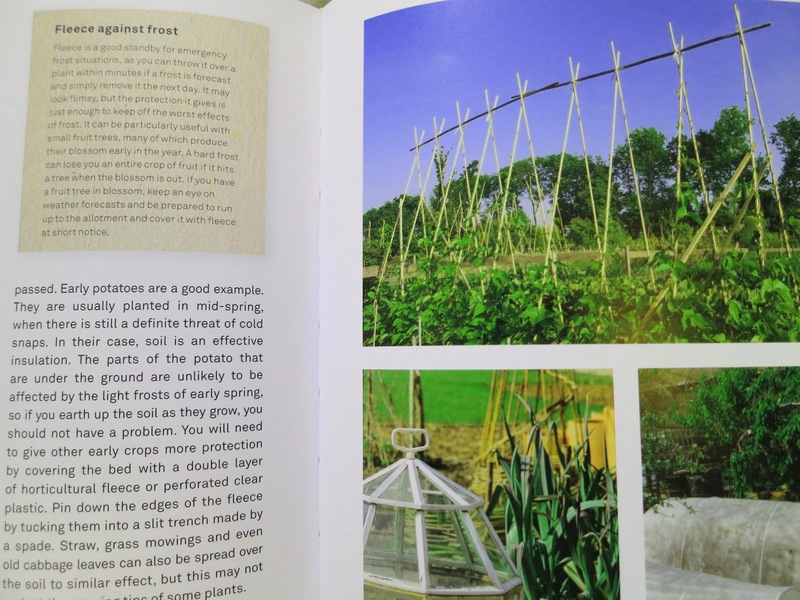 She also says the idea of half-hour allotmenteering was developed by someone called Will Sibley so I spent a while wondering why he hadn't written the book himself, or in collaboration. And I'm just about to confuse you. My test for whether I like or value a book is whether I want to keep a book after reviewing it or whether I'd like to donate it to my local horticultural society. I'm keeping this. Why? It's fun. Well written. And engaging. And there aren't many gardening books I can happily read from beginning to end without abandoning them in favour of dipping. But I did this. Here's the wildly frustrating thing though. 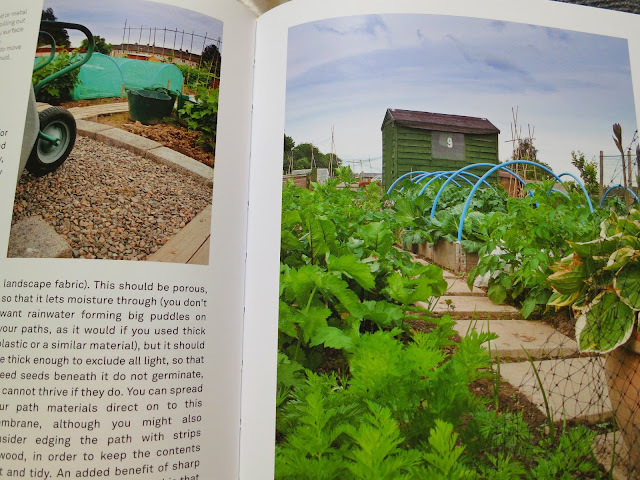 By the end of the first chapter I'd chosen a good allotment (some hope!) established a shed, laid a path and built raised beds - some of them about waist high to save my bad back. Lia does suggest people might like to work in pairs to take account of differing ages, strengths and skills. I'd say you'd need a team of people. There would need to be a car and a lot of spare cash. The allotment would have to be on a route travelled every day or be very close to home. As I read through the book I found I might need old pallets (where would I get them?) which I'd need to nail together. (How would I do that?) And that if I don't have access to logs, I could use a piece of corrugated iron (for slow-worms to creep under). I don't know about you but I'd find it easier to buy logs than rummage around for an old piece of corrugated iron. I might like to pin pieces of card to the ground with large stones. (To suppress weeds.) That sounds ok until you start looking for stones large enough. The earth may seem full of them while you're trying to dig but there are rarely many small rocks. And if I'm to protect potatoes as they begin to grow where will I find a stash of cabbage leaves to cover them with? (Especially at that time of year.) (And will they stay put?) And a garden shredder is not something one is likely to have about one's person. I remember as a student reading that an easy, free and attractive bookcase could be made from some old bricks and couple of planks. Sounds good until you go looking for old bricks and abandoned planks. Who, I am asking myself, is this book for? For young professionals with spare cash who like the idea of having an allotment but don't necessarily need it? With friends who'd like to come and help them out in return for a taste of the good life and a glass of wine? This, of course, could be you! And people prepared blindly to discount 'preparation' time. It's a bit like buying a book called 'Five Minute Recipes' only to discover you will need to spend hours traipsing around in search of unusual ingredients and have a fridge or freezer already stocked with sauces 'made earlier'. 'Five minutes' turns out to mean several days. Then I wondered if it might be for people who are thinking of having an allotment next year, even the year after. People who might need to be put off for a bit until they have thought through the kind of challenges they will meet and have worked out how and whether they can overcome them. I'm a sucker for charts and tables. I'd like it if there were charts to show when to do what rather than relying on the reader to make notes as they go through the book. And it would be amusing (says she meanly!) to have a timetable to show how you can do all this in half hour slots broken up into ten minute pieces. Now I'll go and see what other reviewers have said. They'll probably all be saying how easy it is to set up and run an allotment on two and a half hours a week - and I'll feel stupid. But I'll risk it though. Here I go. Press 'Publish'! (The Half-Hour Gardener is published by Frances Lincoln in collaboration with the Royal Horticulture Society. To order 'RHS: The Half Hour Allotment' at the discounted price of £13:99 including p&p* (RRP £16:99) telephone 01903 828 503 or email mailorders@lbsltd.co.uk and quote the offer code APG378. I haven't seen the book, but I can picture it well, after reading your review! It sounds like a fairly typical "Head in the Clouds" unrealistic affair, as is often the case when journalists are involved. 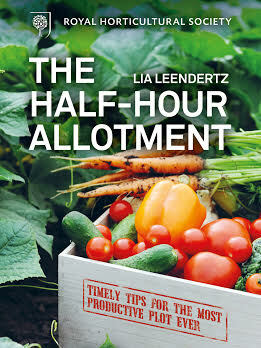 I have no great affection for Lia Leendertz either since she(and Mark Diacono)were to have visited my garden when researching her other recent book about small gardens, but they basically stood me up. Hi Mark. Sorry to hear of your bad experience. The book - it's the half-hour idea that I'm doubtful about. There's much else in the book that's good. I think a lot of garden journalists live in cloud cuckoo land, not least they usually are London based and have more income than the majority of us. We have an allotment which had been neglected, we still are not on top of the bind weed! Great review, very entertaining, and it saves me having to read the book myself - it was like being there! By the way - I WAS one of those students who DID make bookshelves from bricks and planks, although I had to buy the planks. And lastly can I put in a good word for journalists (like me), especially those not living in London! Please don't tar us all with the same brush! Hi Pat. I find it quite extraordinary how low a priority builders of new homes give to gardens. And it's not just that urban space is hard to come by. Lots of people don't like to have gardens. It's illuminating to look through a property website and see how many houses have had their gardens covered with decking as well as gravel; and how many are praised by estate agents for being 'easy care' (ie no earth!). (Not that I've yet managed to grasp the point of decking - especially when it fills all the available space.) I understand there's been a resurgence of interest in allotmenteering over recent years. But if more people were able more-or-less to have small allotments in their own gardens - well, wouldn't that be good? Re. your remark about journalists Pat. In a way, we bloggers are all journalists, for all that we are untrained and unpaid. And the good thing about garden blogging is that individual bloggers can give an idea of what it's like to grow things in a specific locality. To Pat, Point taken. It is very easy to as you say "Tar every one with the same brush". In Lia's defence she does have an allotment in Bristol, so she should be writing from experience. I had the 1st version of this book when I got my allotment 12 years ago, so I hope this is an improvement on that version (which I've since given to a charity shop). It was totally impractical, more of a writing to a publisher's whim rather than being rooted in reality. A shame. VP has taken the words of out of my mouth Lucy :) I too read the first edition of the book so my memories are more than hazy, especially as I've read a lot of allotment related books since. Your comment about photos made me smile. It's taken me the best part of ten years to master putting a bamboo wigwam together. As for putting netting up I've long since admitted defeat!